SYNOPSIS: “First, there was the rousing Iron Man. Now Marvel Entertainment brings the equally exhilarating The Incredible Hulk.” (Vince Horiuchi, The Salt Lake Tribune) Academy Award® nominee* Edward Norton stars as scientist Bruce Banner, a man who has been living in shadows, scouring the planet for an antidote to the unbridled force of rage within him: the Hulk. But when the military masterminds who dream of exploiting his powers force him back to civilization, he finds himself coming face to face with his most formidable foe: the Abomination – a nightmarish beast of pure aggression whose powers match the Hulk’s own!Also starring Liv Tyler, Oscar® nominee† Tim Roth, and Oscar® winner** William Hurt, The Incredible Hulk is “steeped in action and spectacular special effects” (Claudia Puig, USA TODAY) and delivers a mind-blowing final showdown that can only be summed up with one word...INCREDIBLE! REVIEW: If you are a fan of mainstream movies then you’ve got to love the summer movie season. I was looking at an advertisement online and it had a picture of Ironman, Indiana Jones, Hulk, and the Joker all next to each other. It almost brought a tear of joy to my eye. The characters, the fun, the stories, the special effects, the action, and the entertainment this time of year is unparalleled. This year, as in others, Marvel is leading the way with big superhero productions. We all know how good Ironman did and is still doing. Now we have this beastly movie, pun intended. Ironman is still the best movie of the season so far though. I will admit that I was very skeptical of this release considering the prior release in 2003 was still fresh in my mind. I was surprised that this was not treated as a sequel but as an entirely different production, even though Stan Lee and Marvel were involved with both. (By the way, and I do get a kick out of it, Stan Lee does his little cameo as does Lou Ferrigno. They both appeared in the 2003 version as well.) Not that it’s taboo, I mean they are successfully doing the same thing with Batman now, but how far apart are these latest Batman movies from their predecessors. It just seemed too soon to me but you know what, after all is said and done, it doesn’t really matter. This movie is a lot of fun; it’s intense, suspenseful, and action-packed. This one is arguably better than the 2003 version. It has better, more “realistic” action and it just overall looked more real with sharper special effects. This Hulk was more detailed down to the muscle fibers. It has a better plot and it was more entertaining. If you are a fan of the TV series then you will be pleased with Edward Norton’s portrayal of Bruce Banner as being more Bill Bixby-like as opposed to Eric Bana. I know it sounds like I’m bashing that last one, but don’t get me wrong . . . I liked that last one, heck I own the DVD and saw it recently. So to say this one is better, is saying a lot. We catch up with Bruce in Brazil hiding out while trying to find a cure and then the chase ensues. Yeap, just like in 2003, Hulk always seems to be running from the Army. I must apologize for constantly comparing this Hulk to the 2003 Hulk, but I figure it’s the best way to put this film in perspective. This major similarity with the ‘03 Hulk is probably the weakest aspect of this production. It’s a “here we go again” feeling but luckily the action scenes are very different. This one also has some pretty good comical moments that sneak up on you but help you relax a little in midst of all the tense action. There’s even what I like to call a “King Kong moment” between Betty and the Hulk that was interesting. Speaking of Betty, the film was well cast with Liv Tyler playing Betty, Tim Roth as Emil Blonsky, William Hurt as the General (Betty’s father), and of course Mr. Norton. Liv wasn’t bad as Betty, but she wasn’t great either. There is less attachment to her character compared to Jennifer Connelly’s character in ’03. William is as good as Sam Elliott in their common role. Tim Roth was a good choice for his role as he has the talent to bring a cold, calculated, ruthless villain. You’ve got to give Ang Lee some credit for a pretty good job with the ’03 Hulk. I mean come on, it’s Ang Lee. But Director Louis Leterrier, Director of the Transporter series, out did him with this work. Ang seemed to be more into the psyche and drama aspect of the beast while Louis was more into the eye candy and action aspect. If you saw or heard about what happens after the end credits in Ironman, you are in for a treat at the end of this movie right before the end credits. (By the way, there is nothing after the end credits in this picture, so you don’t need to wait to see anything extra). What takes place in that last scene is something special and very, very cool unlike anything I’ve ever seen. I want to say more but I won’t so as not to ruin it for you. Actually, I caught a glimpse of a preview on TV and I saw part of that scene so the cat might be out of the bag already. In either case, let me know what you think of that ending. If you liked the ’03 Hulk, or you are a Marvel fan, or at least a superhero movie fan, put this one on your queue. 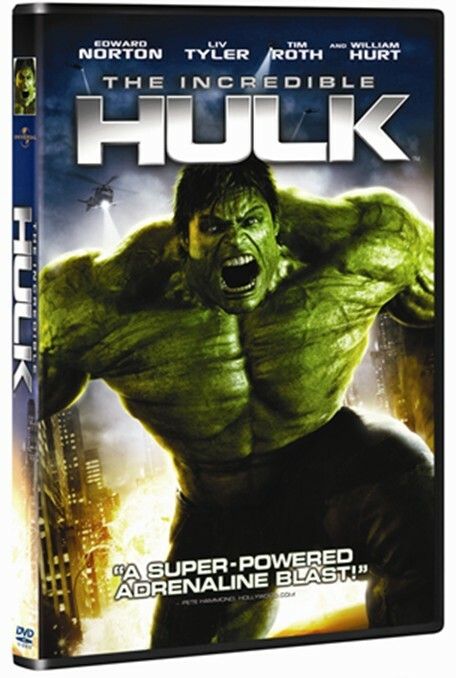 DVD: The single disc DVD of The Incredible Hulk is presented in a nice 2.35:1 anamorphic widescreen format that offers a very good viewing of the film. The picture is complemented with a Dolby Digital 5.1 sound that offer a nice experience of the movie. The film can be play in three different languages English, Spanish and Francais. Since it is the single disc release, the DVD doesn't contain too many special features. Only contains a feature commentary with director Louis Leterrier and Tim Roth and a total of 6 deleted scenes. If you just care about the film this is the copy you should be getting, however, if you desired is to get a full inside look about the film. You should consider getting the 3 disc or the Blu-ray versions of the film.